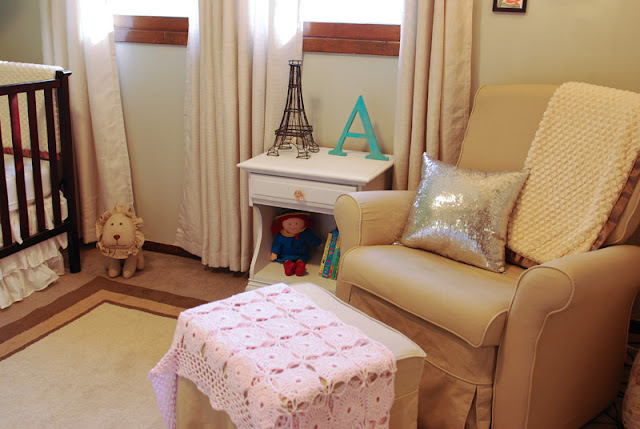 The Baby Cave - Jill Ruth & Co.
A few weeks ago, I finally got a chance to take time to take pictures of our granddaughter's nursery or "The Baby Cave" as her mother calls it. A lot of the room is DIY so thought you might be interested in seeing the projects. This little dauschund was inspired by this dog from Etsy. We also made the big crib bolster in the back. Since crib bumpers are no longer approved because of safety issues for the baby, my daughter came up with the big bolster idea. 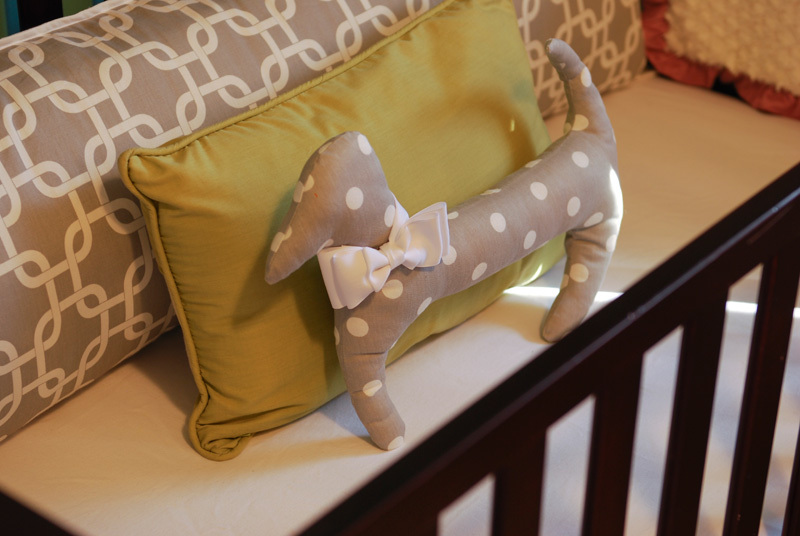 It looks nice and can easily be pulled out of the crib for when the baby is in it. The fabrics came from Carousel Designs. The fabric is really nice and reasonably priced. 3. 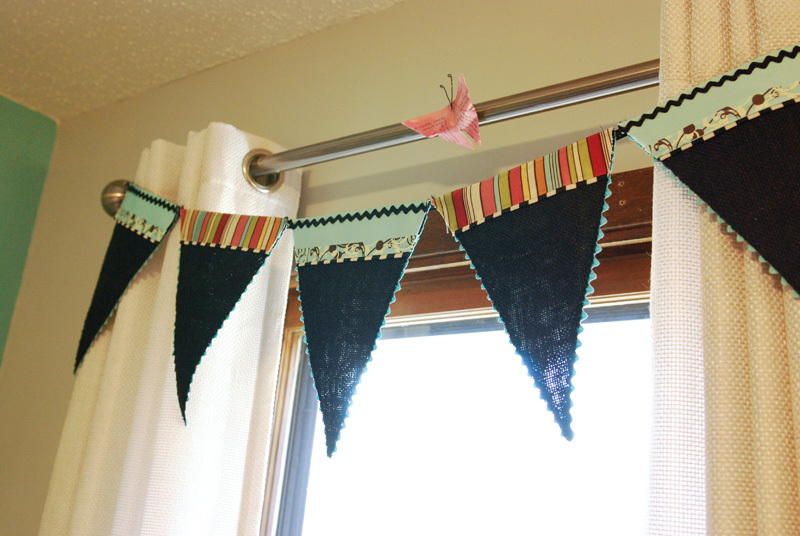 We made the bunting to hang on the window. 4. The crib skirt is three layers of ruffles on three sides of the crib. Sounded innocent enough. "Sure, I"ll make the crib skirt for you! 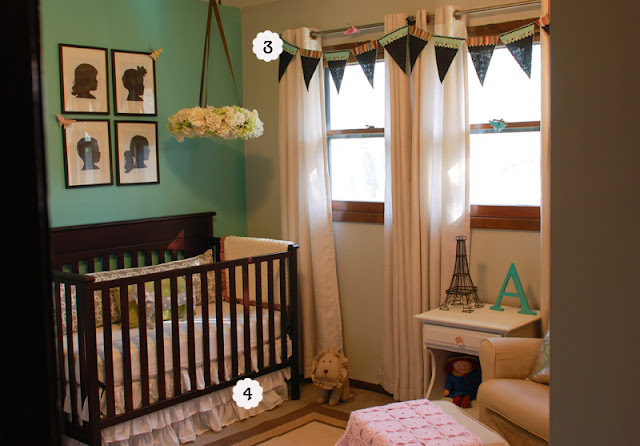 Just help me plan it so it's adjustable as you lower the crib." said I. For some reason the plans were difficult...it took months to finish it. It took 24 strips of fabric in varying lengths to make this. Just because it was confusing and made me think way too hard! It took both of us to figure it out. However, it is pretty and it is adjustable!! We used rick rack, black burlap and ribbon to make the bunting. All glued. I know, right? All just glued. 5. Pinwheel made from book pages. 6. Bookshelves made by baby's father. 7. Ruffled lamp shade. 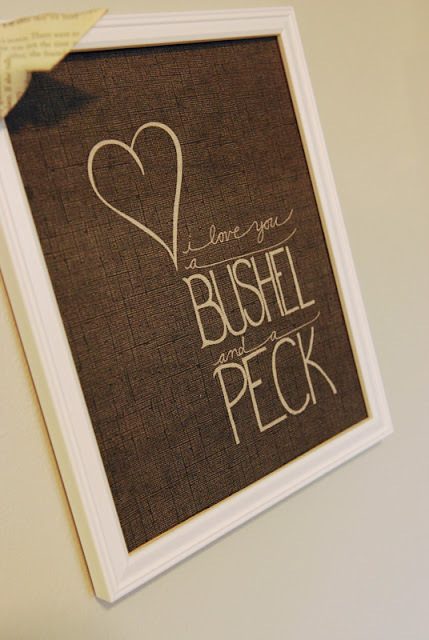 She used ribbon with a long stitch (with machine) down the middle and gathered up and glued on an old shade. 9. 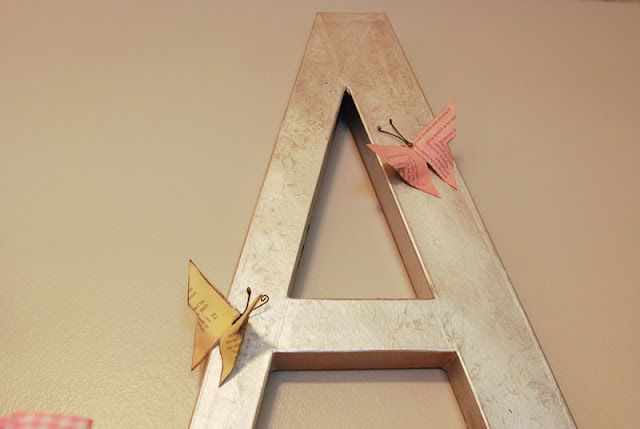 "A" from Hobby Lobby spray painted with metallic paint. My daughter said it fell over in the grass after she sprayed it and the grass imprinted a design that made it look like real metal, bonus!! 10. Little elephant blogged about here. 11. Little picture holder that I won from Connie from Miss Maggie's House. 12.Dresser now changing table: I bought it at a garage sale for $20 and my daughter painted it. It is so nice! 13. Jewelry holder from T.J. Maxx now holds hair accessories. I love picture books!! 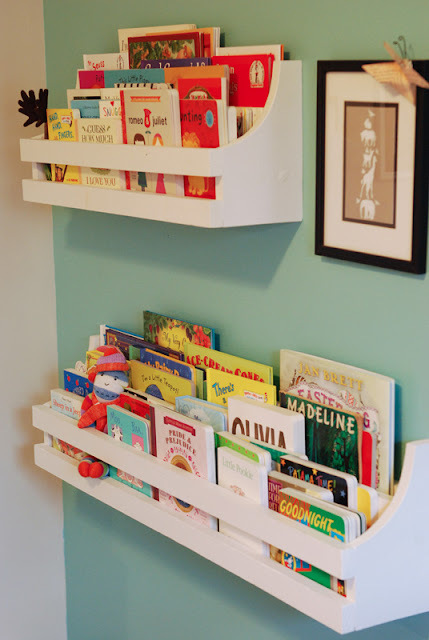 And, these shelves! 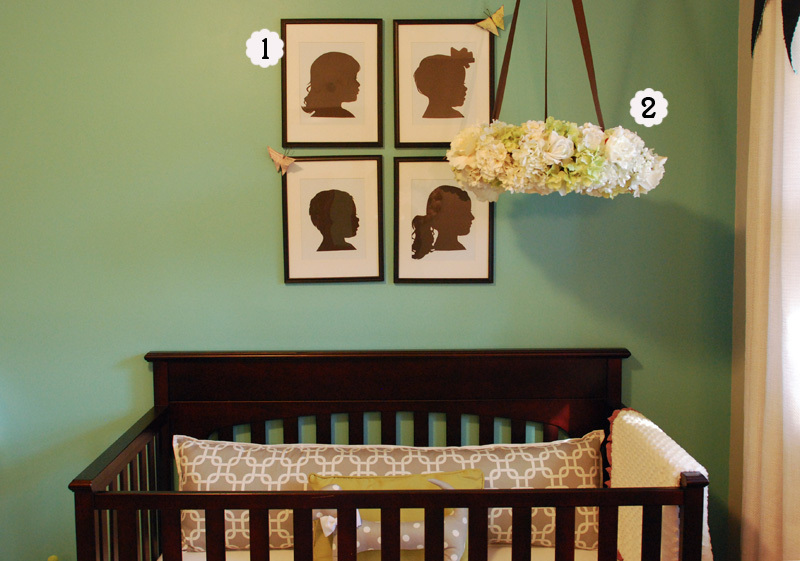 The print in the frame is actually one of the cards from a baby shower. My dad used to say this to our kids and my daughter found this on Etsy. Butterflies scattered throughout the room. See this post for details. 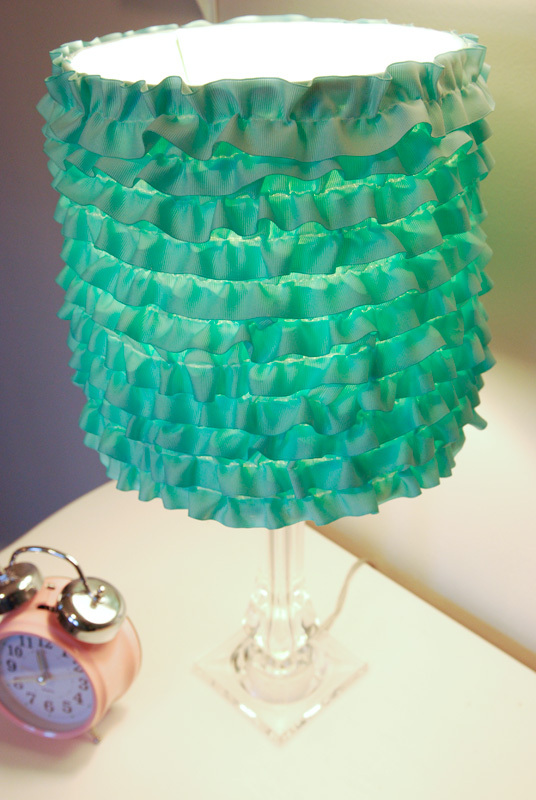 This a really pretty and easy upgrade to a lamp shade. 14. Cards from Rifle Paper Co. Frames from Target. 17. The wreath blogged about here. 18. This is a chalkboard decal the sticks great on the mirror. 15. 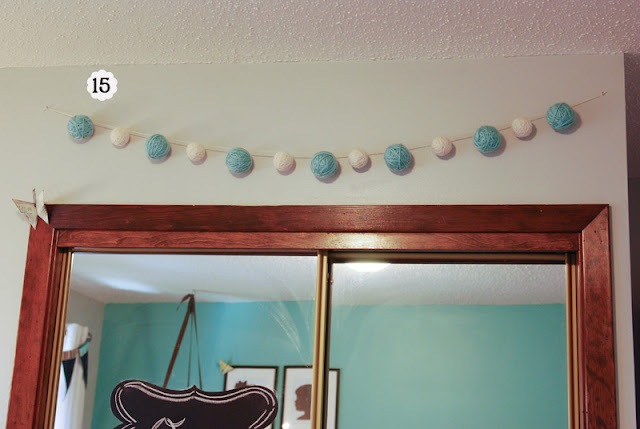 Ball garland we made by wrapping yarn around styrofoam balls. I hope you enjoyed the tour! The room is small, but has a lot of personality. 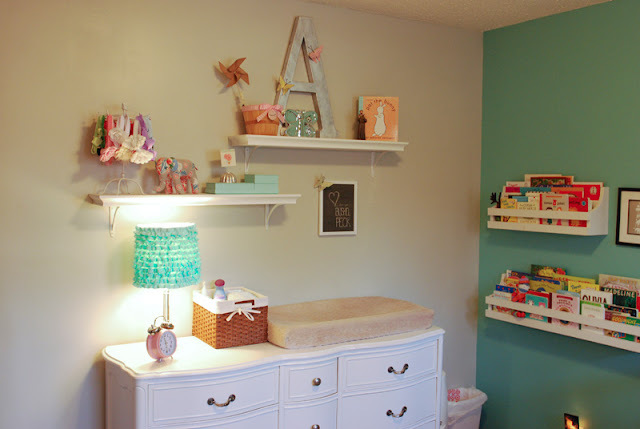 I think my daughter did such a nice job and the room will certainly work for years to come. The big shelf is 37.5" long. The small shelf is 25.5" long. The rest of the dimensions are the same for both. Also, they have since moved....You can view her new "big girl" room here. Now there is a baby sister!! You can view the new baby nursery in this post. 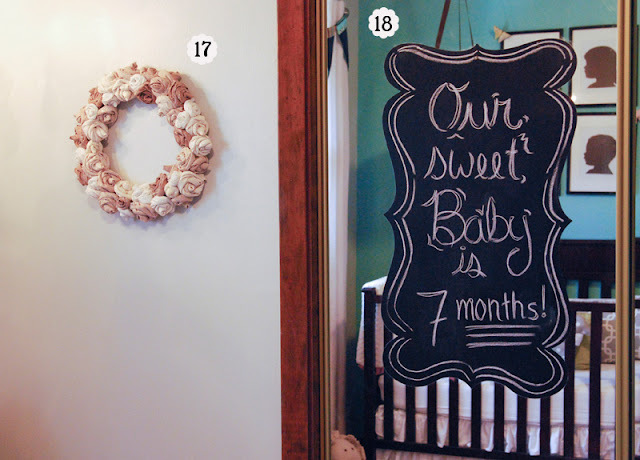 Oh what a wonderful and special nursery with so many fabulous and sweet touches that really make it extra lovely! You girls obviously are having a great time. This would make a nice magazine article full of inspiration! I love it. And thank you for putting all the links in. I'm sure I'll be back visiting this post a few times! I offered to make a skirt for the crib.... but never did... my daughter and I decided she didn't need it. I'm glad I didn't have to do that. ha! I knew that lowering of the mattress stuff was going to create problems! You did a great job! I love the ruffled skirt! It's all wonderful! 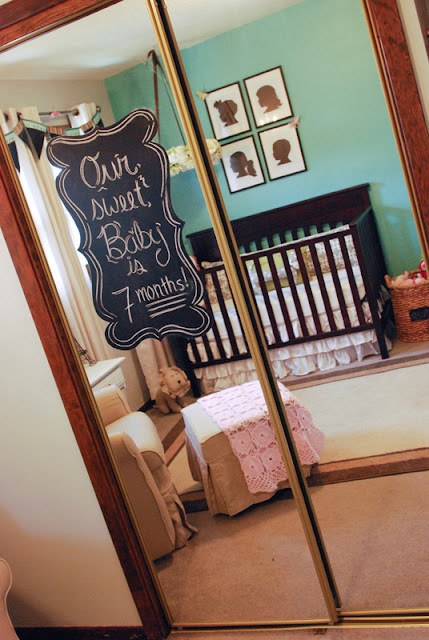 OH my goodness... this room is so, so sweet! I love every bit of it!! That is an AMAZING baby cave! I want to hang out in there! I love it!!! the colors are so calming too .... 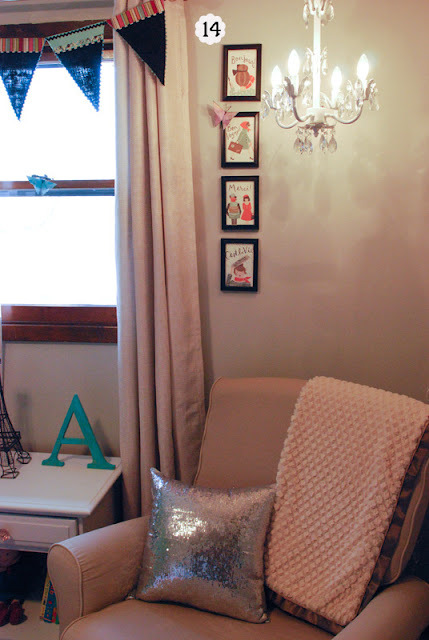 I think my favorite project is the lampshade! So sweet! Very lucky little girl! Cute, cute, cute...so many pretty details!! LOVE the "Baby Cave"...too fun!! 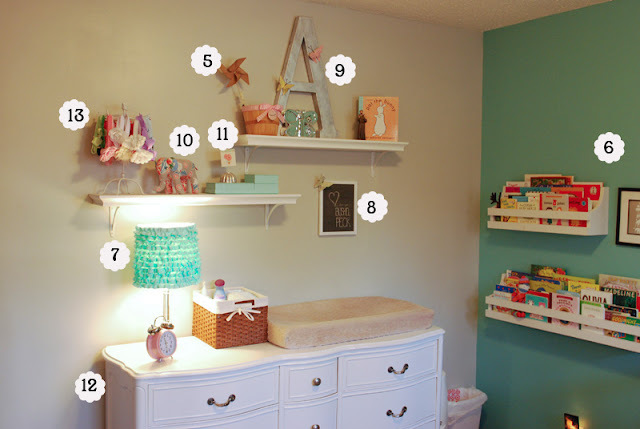 Can you share how your husband made the bookshelves? Love them! It was my son in law who made them and I believe he just looked at some in a catalog and came up with these, so I'm sorry I don't have any instructions for you. 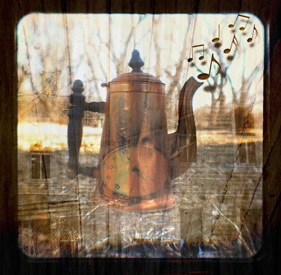 Maybe you could find someone to look at these pictures and make some for you. I LOVE those bookshelves!! Is there any wat you can share the dimensions? Height, width, depth? My uncle said he could try to make similar ones for my nursery but he needs the details. Thanks! I LOVE this room! Thanks for sharing!